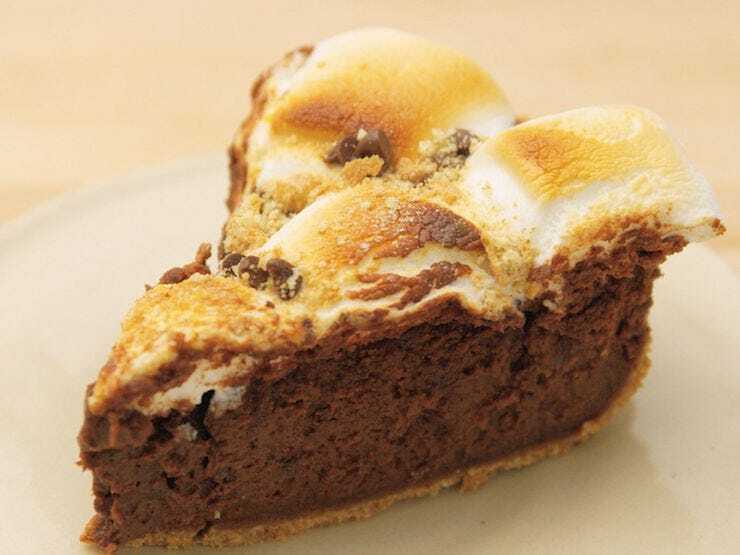 S'mores Cheesecake The perfect s'mores recipe for when you just can't make it to a campfire. Combine the crushed graham crackers and melted butter in a medium-sized mixing bowl. Press onto the bottom of a greased 9-inch springform pan; set aside. Melt chocolate in the microwave for 60-90 seconds, stirring at 20-second intervals until smooth. Set aside. Beat the cream cheese, sugar, and flour until smooth in a large bowl. Add eggs and beat on low until combined. Stir in vanilla, cinnamon, and melted chocolate. Pour filling over crust. Bake at 350° for 35-40 minutes or until center is almost set. Remove from oven and arrange the marshmallows over the top; then, return the marshmallow-covered cheesecake to the oven and cook 5-10 minutes more, until the marshmallows are puffy and starting to brown. Let cool for at least an hour before removing from the springform pan. Garnish slices with crushed graham cracker crumbs and strategically arranged chocolate chips or chocolate shavings.